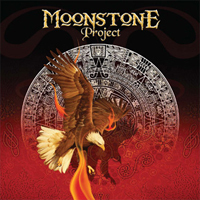 Moonstone Project is an ambitious musical creature of the Italian guitarist Matt Filippini <?xml:namespace prefix = o ns = "urn:schemas-microsoft-com:office:office" />and he/they have just released album number 2 called ‘Rebel on the Run’. This CD features James Christian on all tracks except for one. Glenn Hughes sings the last one. Nik Mazzucconi (Bass), Francesco Jovino (Drums) completes the band. The music is classic rock and nothing wrong with that, but this CD fails to impress me. Most of the songs are way too boring for my taste. Some songs are leaning towards funk-rock or blues rock and I can’t exactly say I’m a huge fan of either funk or blues. I have 10 tracks in my possession and it’s only the Status Quo-like boogie/blues song “Hey Mama” that I really dig. “Madman” isn’t bad either but the rest of the songs goes into one ear and out the other. I will ask you politely to check this album out... because I’m sure that most of you out there will feel way different about this CD than I do.